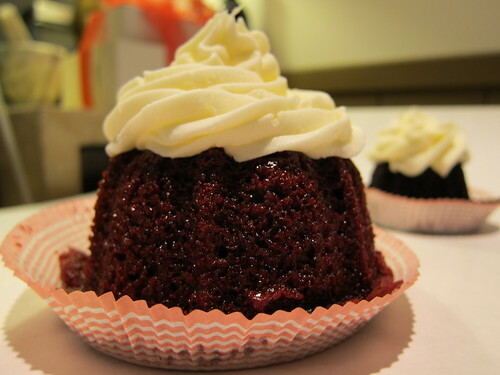 Kiss My Bundt offers vegan red velvet on Fridays and Saturdays as well as vegan chocolate on Saturdays. They may be vegan, but they certainly don’t look nor taste like they’re in shortage of any sort of ingredient. Incredibly moist and delicious, the red velvet will never let on what you’re missing…it’ll be a secret between you and your bundt. And if you’d like a sizeable order (6 mini-bundts or more), the vegan bundts are available any time of the week. What are you waiting for? Also please read about Kiss My Bundt on ShopEatSleep. Try a full-sized bundt and help keep the most delicious cakes in town around! The Bakery at Akasha has a few options available for vegans at their storefront. Pick from chocolate cupcakes, tarts and cookies – or go for their meyer lemon scone. If you’re seeing a movie across the street, best come early and buy a few treats to sneak into the theatre – it sure beats the $8 popcorn at the concession stand!